As we enter into 2019, Brexit remains the biggest question for UK property investors — whether there will be a deal, no deal, or no Brexit. The option of Remain seems off the cards, and despite the recent rejection of Theresa May’s deal by Parliament, we think that the risk of a no-deal is unlikely. Few MPs want such a drastic breakaway, and many will start to get antsy as the deadline fast approaches. The UK housing market as a whole soared to record highs in the past few years. 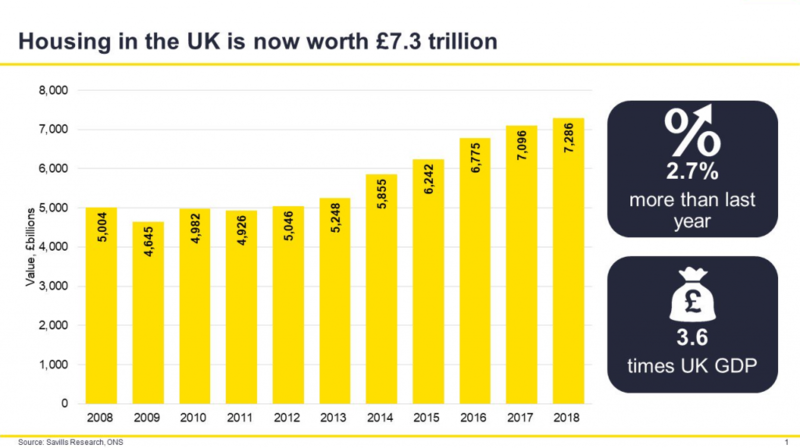 Research by property firm Savills showed the total value of UK housing stock had increased by £190 bil to its highest level ever — a mind-boggling £7.29 trn. “Our analysis demonstrates the scale of the housing market and underlines the importance of housing to the economies of London and the UK as a whole, both as an asset class and store of private wealth,” said Lawrence Bowles, residential research analyst at Savills. Unlike the 2008 financial crisis, where market values remained relatively stagnant until 2013, the UK housing market continues to grow in the face of Brexit. Growth pushed up by 2.7% in 2018. “It’s great that we’re seeing more housing delivery, but development will have to make up a much higher proportion of new housing value if we are to come anywhere near building the homes this country needs,” Mr Bowles added. 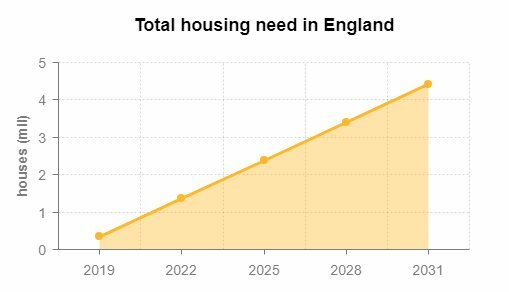 Right now England is facing its biggest housing shortfall ever, with a backlog of 4 million homes. 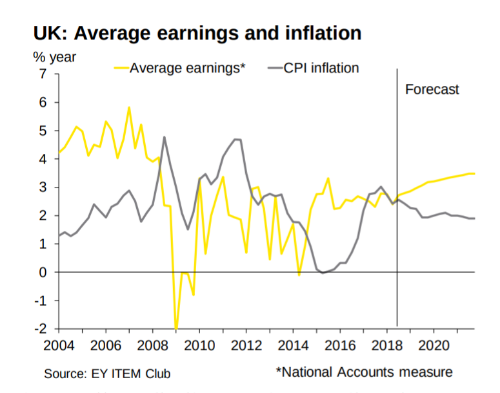 Advisory firm Ernst and Young forecasts an upward trend for the UK’s GDP, predicting growth by 6.9% from 2019- 2022. Spending power will also start to increase this year as earnings are expected to rise by as much as 3.0% while inflation is predicted to drop to 2.0%. Once a deal has been struck, the British pound is expected to go up. Property firm Colliers International predicts a 5% to 10% appreciation in value, while global assets manager Aberdeen Standard Investments says the sterling might potentially climb by 15% from its current level within 3 months of a deal. Recovery of the pound will slow inflation and lead to stronger income growth that will support prices. The high-end residential sector will benefit from greater certainty by foreign expats working in London and the preservation of the UK’s financial services sector. Savills forecasts UK house prices to rise 14.8% from 2019-2023, although there will be significant regional variation. Where in the UK should investors look to gain the most in 2019? The timeless advice is to look for cities with strong fundamentals, e.g. a thriving local economy and industry. Three UK cities in particular that we recommend investors to keep their eyes on this year are London, Manchester, and Birmingham. Property in the capital now makes up a quarter of the total UK housing value. A decade ago, it was just a fifth of the domestic market. The London market is now worth a stunning £1.77 trn, over four times the combined value of Birmingham, Manchester, Edinburgh, Glasgow, Cardiff, Bristol, Liverpool, and Sheffield — all cities which saw higher rates of price growth than the capital in 2018. The city may have experienced a slowdown since the Referendum, but that has not deterred overseas investors. London was the top city in 2017 globally for cross-border office investment, ahead of New York, Frankfurt, Berlin and Paris. Last year saw nearly one in five (18%) new-build homes in London being purchased by overseas investors, 61% of which hailed from Hong Kong, Singapore, Malaysia and China. Property firm JLL expects a bounce back after Brexit. Adam Challis, head of residential research at JLL, says that values will nudge up next year before accelerating faster with a greater sense of job security. JLL predicts that the average price of a new-build home in Zones 1 and 2 will jump 17.6% between Brexit and 2023, making central London property a good buy for investors right now. House price growth will be driven by the escalating supply crisis within the capital. Housing starts are expected to remain around 20,000 units a year over the next three years, and begin to rise towards 25,000 a year by 2023. This falls a long way short of the Mayor of London’s target of 66,000 new homes per year. The housing market is booming in the UK’s ‘second city’. Greater Manchester’s population has surpassed 2.7 million, and is predicted to rise to almost 3 million by 2031, with the City of Manchester alone accounting for 36% of the growth. The Government projected that if house-building efforts do not catch up with projected growth in households, there could potentially be 1,500 more families than homes in 2026 — and 9,400 more by 2037! Anthony Stankard, from agents Reside on Deansgate, said: “People follow jobs, and the strength of Manchester and the city region is in its continued economic strength. “The airport, together with Airport City and MediaCity are key factors, but underpinning it all we have the universities. The newly announced Faculty of Science (of Manchester Metropolitan University) alone will provide enough jobs on its own to fill a couple of residential towers. With the the new High Speed Rail (HS2) due for completion in 2026, Manchester will be eight minutes over an hour from the capital. 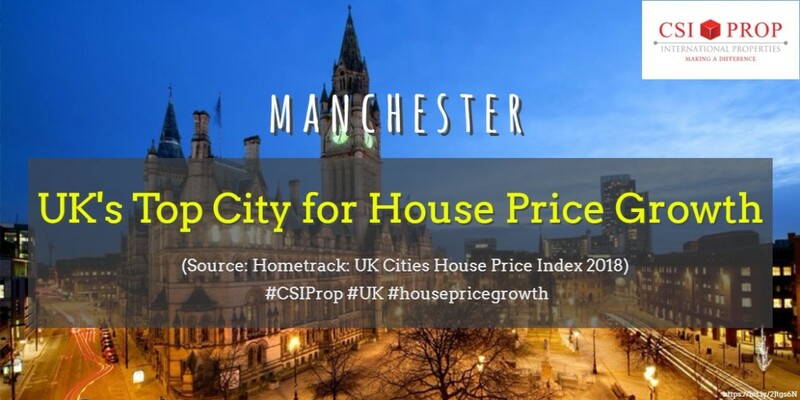 Data from Hometrack showed Manchester at the number one spot among all UK cities, with a price growth of 6.6% in the 12 months to November 2018. Houses in the city are priced at an affordable average of £168,900, just over a third of London’s £481,800. JLL predicts house prices in the city will go up by 14.5% from 2019-2022, whilst rental growth is expected to reach 13% over the same time period. Birmingham’s position at the heart of the UK plays a major part in the city’s ever-growing attraction as a hotspot for business and manufacturing. 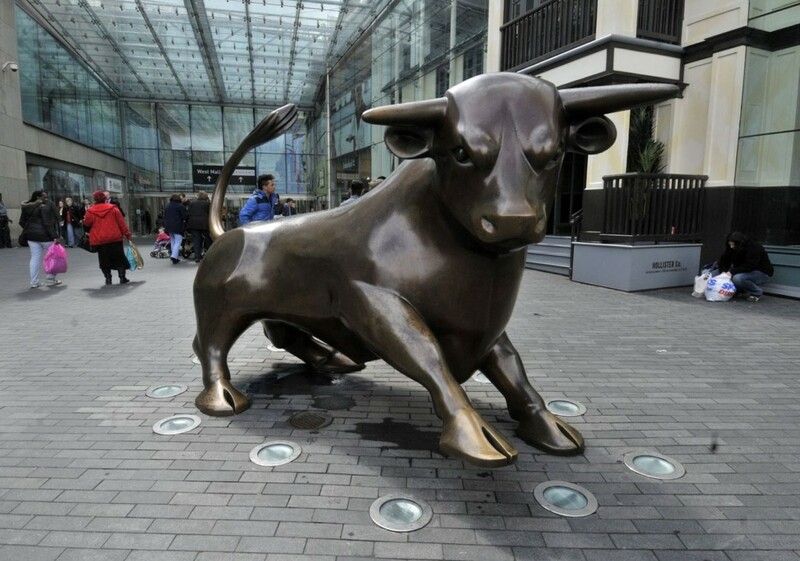 According to a study by consulting group PwC and think tank Demos, Birmingham is the fastest improving city in the country to live and work in. Falling unemployment and a wave of regeneration projects boosted the city to its place at the top. A torrent of regeneration started in the city after it won the bid to host the 2022 Commonwealth Games, with developments such as Birmingham Smithfield, Arena Central, Paradise, and the Midlands Metro extension currently underway. Birmingham also has the honour of being the youngest city in Europe. Out of a population of 1.1 million, nearly 46% is estimated to be under the age of 30. The city’s youthfulness and strategic location have made it a hotbed for start-ups. The city consistently had the highest number of start-ups in the country outside of London since 2016. Once the HS2 is complete, Birmingham will be a mere 49 minutes away from the capital. Data from Hometrack showed Birmingham at second place among cities in England, with a price growth of 6.3% in the 12 months to November 2018. 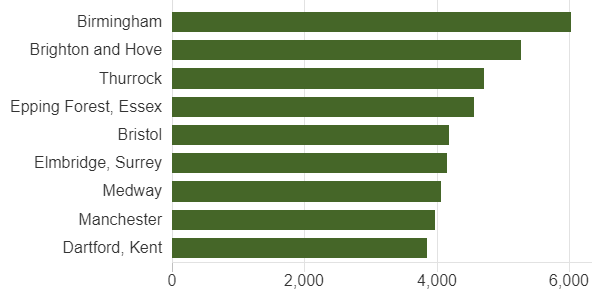 Houses in the city are priced at an average of £163,600, which is slightly less but on par with Manchester. JLL predicts house prices in the city to go up by 15% from 2019-2022, with rental growth expected to reach 13.5% over the same time period. The British pound is set to rise quickly, which means property investors can get better returns by buying now. Don’t miss out! If you are looking for property in the cities of London, Manchester, Birmingham and more — give us a call at (+65) 3163 8343 (Singapore), 03-2162 2260 (Malaysia), or email us at info@csiprop.com! If you would like to read more on property in the UK and Australia, check out our Investment Guide here. Manchester recorded a 7.0% increase in house price growth compared to London’s dismal 0.4%. Manchester is England’s top performing city for house price growth, the latest data from Hometrack shows, while London remains on a flatline. The data comes from the property research firm’s UK Cities House Price index, which tracks housing data across 20 UK cities and regionally. For house price growth over the last 12 months, Manchester obtained top spot at a cool 7.0% increase followed by Birmingham at 6.5% and Liverpool at 5.9%. Price growth in London showed no signs of recovery, staying at a stagnant 0.4%. Across the UK as a whole, prices have gone up by 4.3% over the last 12 months. 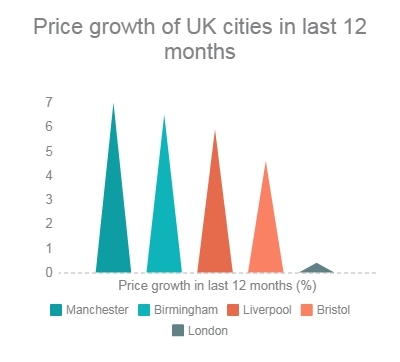 Price Growth of UK Cities in last 12 months: Leading cities in the UK that outshine London. Many cities in the Northwest have posted high capital gains over the average for the last 12 months. Yet, there is still much room for growth, as prices remain low, well under the national average. The average price in Manchester was at £163,200, Birmingham is at a slightly lower £159,800, and Liverpool, at £118,800. Comparatively, the average price of a home in Britain is £217,400. Although price growth in London is stagnant, housing in the capital costs more than double the national average, at a whopping £491,200! 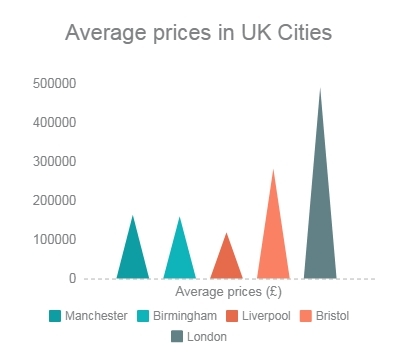 Average Prices in UK Cities: London prices are at stratospheric levels, making high yields and capital gains quite impossible. Richard Donnell, Insight Director at Hometrack says that the London market is going through a period of price alignment, having posted some very large gains over the past 8 years. Homes in the capital have become unaffordable for many people after years of surging prices, while wage growth remains meagre and lenders apply tougher mortgage criteria. However, the price gap between regional cities and the capital is narrowing. Hometrack expects the gap in prices between London and other UK cities to close further over the next two years. This follows a similar pattern from 2002 to 2005 when London house price growth was relatively weak compared with the rest of the country, after a period of surging prices from 1996 to 2000. Manchester and Birmingham are expected to be the first cities to move closer to London prices, with demand for housing likely to be boosted by strong job growth. They are forecast to return towards average prices being around half of those in the capital compared to a third today. “The level of house price inflation seen in large regional cities during the last peak, between 2000 and 2003, gives a good indication of how much prices may rise this time around. If history is to repeat itself and these cities are to get back to where they were, then prices could increase by as much as 20-25%,” Richard adds. This weekend, find out more about this amazing project in Manchester and how you can profit from it. This weekend, learn how you can invest £75K & GET BACK £190K in 5 YEARS with the POWER OF LEVERAGE! 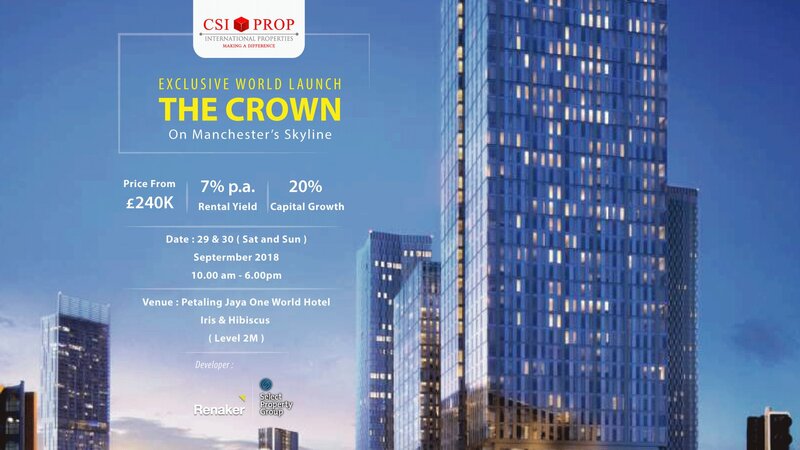 Come for the EXCLUSIVE WORLD LAUNCH of an iconic new residential development in the Manchester city centre – THE CROWN On Manchester’s Skyline. Call +60162288691 to book your seats now! Part 1 of our Manchester series underscores research highlighting Manchester as the UK’s no. 1 property investment hotspot in the next 10 years. In Part 2, we discuss why Manchester is poised to have the strongest rental market in the UK. According to Savills, demand for rented accommodation has increased by 17,500 households per month over the past decade to 2014. This demand for rented homes is set to rise by more than 1 million households over the next 5 years. The private rented sector in Manchester is slated to boom with over 10,000 new build-to-rent units are due to be built over the next few years. This is due largely to the Mancunian city’s largest concentration of young working adults, i.e. the Generation Y.
Manchester has the youngest working demographic in the whole of the UK. The city’s population is rising quicker than any city outside of London and 2.85 million people will live there by 2025 – 89% of this new population is Generation Y. 58% of graduates from the Greater Manchester universities enter employment in the local area. That’s almost 20,000 new workers a year. Every year. Aspirational and career-focused young people are naturally drawn 70,000 new jobs will be available to them over the next decade. City targets state Manchester needs 4,000 new units a year to house its rapidly growing Generation Y market. Only 1,417 annual units are set for delivery over the next eight years. Two-thirds of this supply is still subject to planning. This post is originally published by Select Property Group. Phase II of London Spring Place which launches in Kuala Lumpur end of February. Phase 1 sold out within the year of launch! UK student property is the strongest investment platform today, surpassing other traditional real estate classes. In 2015, the UK student property sector saw investments to the tune of £6 billion – twice the amount invested in the sector in 2013 and 2014 combined. Experts say the sector is likely to see more investment in the years ahead. Formerly reserved for institutional investors, UK student property has become one of the most popular investment vehicles to date in the world of property investment. From a mere £500 million in 2010, direct investments in the sector reached £6 billion in 2015, surpassing the £3 billion in 2013 and 2014 combined. More significantly, this marks an increase of more than 300% over the £1.7 billion invested in 2014 alone. Is Growth in the Sector Set to Continue? The fact remains that there is still an acute under supply of purpose built student accommodation (PBSA) in the UK due to restrictions in building permissions, a challenging planning environment and the government’s support for housing development. Meanwhile, the number of foreign students continues to rise due to recently abolished restrictions in foreign student numbers, which comprise the traditional mix of new first year students and second- and third-year returners. To illustrate, the number of foreign students at Britain’s top universities doubled between the 2005/2006 and 2013/2014 academic years. These students tend to come from wealthy families who are able to afford the soaring cost of tuition for non-European Union residents and demand a high-class standard of living. The Higher Education Statistics Agency reported that the number of residents living in private halls more than doubled between 2007 and 2014—from 46,000 to 102,000—a trend predicted to continue. The dramatic upswing has been fuelled by the inability of university-managed accommodation to keep pace with student numbers. London’s full time student population alone is expected to rise by 50% in the next 10 years, whilst student cities, particularly where there is a Russell Group university, is expected to see dramatic increases in student numbers. EU and non-EU students are the fastest growing segment, bringing a net benefit of £2.3 billion per annum to London’s economy supporting 60,000 jobs in the capital. But, beyond the fundamentally undersupplied market, one reason for the success of PBSAs is that students have become more discerning, especially in light of increased tuition fees. Unite Group reports that 85 per cent of second year undergraduates are now looking for quality, purpose-built student homes that fulfill all their needs (including peace and quiet and access to night life), and with the CBRE statistics showing that student accommodation generally has occupancy rates of some 99%, it’s easy to see why people put their money into this area of the market. The structural undersupply in purpose built UK student property has caused prices to skyrocket. Student housing charity Unipol, for example, reported a rent rise of 25% in purpose-built student accommodation between 2010 and 2013 – nearly double the rise in the rental sector as a whole in that period (13%). Experts predict that student housing will experience a continued strong demand but with significant supply side challenges in London and key student towns. With this demand from students for more luxurious space, coupled with rising student numbers and strained supply, there is certainly potential for all sorts of investors to get top marks for their shareholders and earn strong income and profits from the sector. Ultimately it’s not just about what you invest in; it’s also where you invest in. In a recent report in the Property Wire, several student cities were highlighted as the next investment hotspot including Manchester, Liverpool, Birmingham and Brighton. Looking ahead, it is also likely that London will continue to be an attractive city for students from across the UK and around the world. However, there is the risk that prospective students will be put off by the cost of living in the capital (house prices have risen by 46% and private sector rents by 19% over the last five years according to the ONS). ‘So long as demand outstrips supply, upward pressure on both rents and capital values will continue to make the market an attractive proposition for investors, and we don’t expect the market to come off the boil for some time,’ says CBRE head of student housing advisory Jo Winchester. British housing prices have risen sharply in the last two years, thanks to record low interest rates, an under supply of property (vs. demand), and a strong employment market. Thus, annual rental returns are attractive, which bodes well for the buy-to-let investor. There are nearly 2 million private landlords in Britain, owning almost 20% of homes, and the positive environment has only added to the appeal of buy-to-let property, also known as rental property. However, the government is taking steps to cool the market in a bid to protect the interests of potential first-home buyers by introducing new tax rates on buy-to-let property. In a budget statement in November last year, Chancellor George Osborne announced that buy-to-let investors will have to pay a 3 percentage point higher rate of stamp duty than residential buyers due effective from April this year. Meanwhile, come 2017, landlords’ abilities to deduct mortgage interest from rental income before working out a tax liability, will be phased away. All this on top of a predicted rise in Bank rates. Some doomsayers are anticipating an extreme downturn in the property market, suggesting that investors purchasing mortgaged rental properties today are set to lose money within 5 years. There are also suggestions that potential buyers could turn into sellers, flooding the market with additional supply and slamming the growth of the rental property sector into reverse. What do these measures mean for the Malaysian Investor? It appears that the new cooling measures will mainly affect UK residents, as the presumptions are that UK landlords fall within the 40%++ tax bracket. Foreign investors, i.e. Malaysian investors do not earn salaries in the UK, which means they naturally fall within the lowest tax bracket to begin with, i.e 20% tax for income below £31,865 p.a. Additionally, Malaysian investors have an extra £10,000 as an annual tax-free exemption on rental income. This means that the Malaysian investor will hit the 40% tax bracket and therefore start experiencing some differences only upon earning £41,865 p.a. in rental income. Assuming a nett yield (after deduction of all expenses) of 4% for rental properties, the Malaysian investor would need to own investment properties worth more than £1,000,000 before he/she hits the 40% bracket. Currently, as most London properties are only raking in 1% – 2% yield, the reality is that you would need to have £2,000,000 to £4,000,000 worth of properties before you hit the 40% tax bracket. Meanwhile, the removal of mortgage interest in tax deduction will affect investors buying rental properties in their personal names. In order to get around that, more individuals are resorting to buying rental property under a company structure. Under the new measure, landlords will not be able to deduct mortgage interest from their rental income before it is assessed for tax but will instead get a flat-rate 20% tax credit. This means those paying higher-rate tax will lose half of their relief, while some others will be moved up into this bracket and so see their tax bill soar. As such, using a company structure means interest, which is classed as a business expense, can still be deducted. Corporation tax would also apply which would reduce a higher-rate taxpayer’s rate from 40% to 20%. (Remember, unless you own properties worth £2,000,000 – £4,000,000, you would be hard-pressed to hit the 40% income tax bracket. Mostly, Malaysian investors are within the 20% bracket which means the removal of mortgage interest in tax deduction will not apply, as they automatically get a 20% tax credit under the law. Again, only the ultra-rich are affected). Student property investors are not affected as mortgages are typically not offered for that investment type. According to CSI Prop spokesperson Virata Thaivasigamony, these latest measures are part of a populist stance as Britain gears up for the elections. “The biggest domestic issue is the affordability of housing in the UK and how it has affected first-time house buyers. Landlords, especially foreign landlords, are blamed for the hike in house prices. These housing measures seem like a political move,” says Virata, adding that heavier restrictions would have been imposed on the investor if the market were headed for a collapse. “In the Autumn Statement, George Osborne also announced a 40% interest-free help-to-buy loan for first-time house buyers. This shows that he isn’t really trying to cool down a market that is on the verge of a crash, rather, it gives mileage to his political cause by appealing to the interests of new British home buyers. “If you look at the fundamentals, it is clear that the UK has a shortage of housing due to low levels of construction since the recession in 2008. This has choked housing supply, causing house prices to inflate. And while building of homes is picking up now, it takes time before that translates into sufficient homes. What about the London property market, specifically? “London has always been deemed as the international safe haven, which is why foreigners tend to diversify their wealth in London. Because of that, it’s hard for property in London to crash either. The prices have gone up steadily in the recent past, but I foresee a plateau (in prices) and, in the meantime, areas like East London — previously previously seen as undesirable — will experience major construction and subsequent price growth due to gentrification,” Virata adds. Overall positive outlook across the UK, but central London growth subdued. The year started on a bleak note, no thanks to the current global economic climate. On the property front, the beginning of 2016 in the UK was headlined by policies to be imposed by the Chancellor on home-owners and landlords,such as future tax and stamp duty increases, and the abolition of mortgage income relief in 2017 – all this on top of predictions of a rise in Bank Rates, prompting doomsayers to predict an extreme downturn in the property market with projections stretching to 2021. Raising taxes and other rates are usually measures used by the government to protect the welfare of its house-buying citizens by preventing skyrocketing property prices and overarching speculation resulting from uncontrolled property-buying by wealthy local and foreign investors. The CGT in Singapore and Hong Kong and the RPGT in Malaysia, as well as FIRB taxes and stamp duty hike in Australia are a good example. We’re not saying you should ignore it; we’re just saying it’s not a deal-breaker. To illustrate, a survey by the Council of Mortgage Lenders found that despite the negative outlook, landlords are confident that they will be able to absorb the impact of tax changes while over 80% are confident they won’t have to raise rents in order to cope. As for all that talk on Bank Rate increases: the trend for pushing forward forecasts for the rate rise into the future has been going on since rates were cut in 2009; the prediction keeps getting pushed back in the end. Currently, Bank Rates stand at 0.5%; the prediction for a rise was set for Dec 2016 or Jan 2017 following the first rate rise in the US in 9 years, last December. But with the global economic gloom of 2016 and comments of the Monetary Policy Committee (MPC) along with dramatic market movements, money markets imply that the first increase is poised for Aug 2019. Bank of England chief economist Andy Haldane said last year that the case for UK raising interest rates was “some way from being made” and that negative rates may still be needed.